Negotiations for the re-homing of the slow loris are continuing after another offer for relocating the illegally imported animal appeared to have stalled. After new inquiries from the UK regarding the possible re-homing of the endangered animal, the Ministry of Environment has revealed that communication with prospective new carers has broken down. The mission to re-home the slow loris has proven difficult since the illegally trafficked animal – who was discovered in the Maldives during a drugs raid by police in January – has no formal paperwork or certified country of origin. The Ministry of Environment subsequently considered euthanasia based on a number of factors which made re-homing the animal both difficult and costly. The media coverage of this decision and an online petition drew further attention to the matter, resulting in various international partners expressing an interest in rehoming the endangered primate. The Jakarta Animal Aid Network (JAAN) had originally offered a home at the Slow Loris Rehabilitation Centre in Jakarta, though recent correspondence obtained by Minivan News has revealed that they are unable to repatriate the creature as it is not native to Indonesia. More recently, an offer was received from the UK-based Monkey World Ape and Rescue Centre, who suggested that the Jim Cronin Memorial Fund for Primate Welfare & Conservation may be able to cover the costs if a location could be secured. Correspondence between JAAN and the Maldives government had previously revealed that the country was unprepared to meet any of the costs for sending the animal abroad. Despite these initial positive emails exchanged, the Ministry of Environment has confirmed with Minivan News today that no further correspondence has since been received from Monkey World. Meanwhile, the Maldives National Defence Force has denied reports that new parties have shown an interest in relocating the corocodile – or ‘Kinboo’ – currently under its care in Malé. 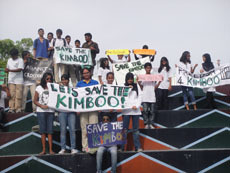 A protest took place last week outside the enclosure – in the children’s park – where the Kinboo has been kept since its discovery on the coast of a local island in 1998. The crocodile has attracted a number of protests, including one led by the Billabong International school in 2010, which drew attention to the small cage and bad conditions the animal has been kept in. Speaking with Minivan News today, an official from the Ministry of Environment said that promises to rehome the Kinboo had repeatedly run into problems. “In the past years there have been many unsuccessful attempts to send it abroad,” the source stated.